“John Parry (?1710-1782), the ‘Famous Blind Welsh Harper’, was probably born in Bryn Cynan, near Nefyn on the Llyn peninsula, North Wales. 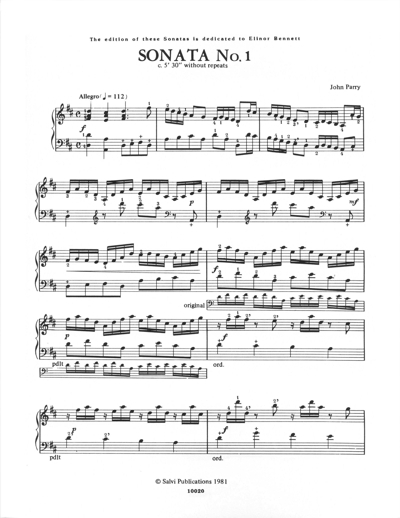 One can believe he had any of three teachers (Robert Parry, a relative; Stephen Shon Jones; or Lewis Morris) or one may choose to believe his playing ability was a gift from heaven, as claimed by a jealous pupil. 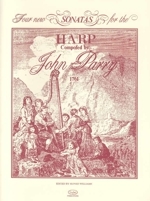 Wherever his talent came from, it reached the attention of Sir Watkin Williams Wynn,…and Parry became harpist to his family, thus assuring that he moved in the highest circles of society in Great Britain…It was in 1761 that Parry published his ‘Collection of Welsh, English and Scotch Airs with new Variations, also Four new Lessons for the Harp or Harpsichord Composed by John Parry…’ from which the ‘Sonatas’ are taken…John Parry is probably the most famous harpist Wales has produced; his importance as a collector of national melodies has long been recognized, but he also should be credited as an original composer whose works have much to offer…The character of these works is very much what one might expect from a musician familiar with the music of composers like Handel, Corelli and Vivaldi and yet very aware of his Welsh roots…The term ‘Lesson’ was in use in that period to mean Sonata, not at all for teaching, though these pieces like any others can be used for improving one’s technique, particularly in clean finger work, articulation and damping (muffling)….” S. Williams Includes historical information, explanation of signs, and examples of ornamentation.